Based on the design of the old Burns Tri-Sonic® Pickups, my Jazzmaster Sonic '60s have been created to fit a standard Jazzmaster scratchplate & cavity with no modifications needed. With custom covers, my Creamery Sonic '60 pickups have been designed for a richer, sweeter, more rounded take on the classic bright Jazzmaster sound. 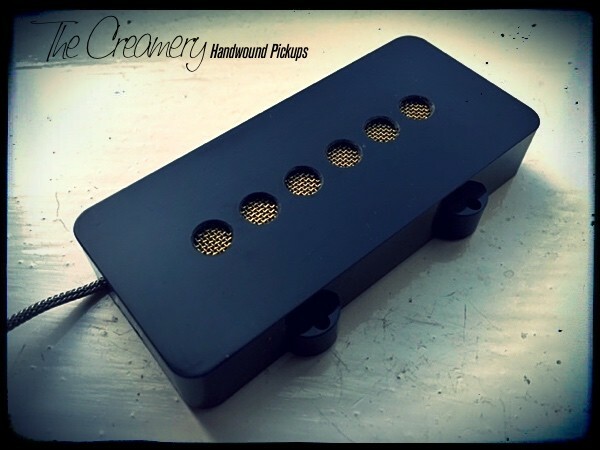 With handwound coils pressed around the custom magnets and wax potted in a combination of paraffin & beeswax, my new Creamery Sonic '60 Jazzmaster replacement pickups give that richer, musical sound synonimous with the old classic Burns Tri-Sonic® design. Geometry dictates they won't sound identical to the old 60s classics as the pickups are standard Jazzmaster size and I use my custom made thinner magnets inside the pressed coil, but they're designed & tested to be richer, sweeter and more rounded than standard Jazzmaster pickups. Unlike the larger originals, my Sonic '60 Jazzmaster pickups have been designed to fit a standard scratchplate & body cavity but with outputs of 7.2k & 6.3k respectively - they've been designed to balance the old vintage sounds with a modern spin for a richer, warmer, more rounded, musical sound than a standard Jazzmaster pickup set. With a choice of magnets, you can choose to have a warmer or brighter version. Alnico 2 'holds' the strings a little less, allowing them to vibrate a little more freely giving a perceived slightly warmer, more resonant sound. Ceramic, being stronger, holds the strings a little more giving a slightly more attacking, slightly brighter, more focussed, less richer sound. Alnico 5 offers a slightly brighter, more attacking characteristic than Alnico 2 but a little more rounded than the ceramic option.